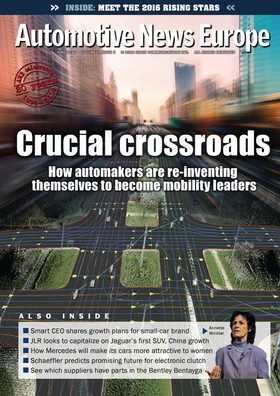 The latest issue of the Automotive News Europe monthly e-magazine goes live on Monday, June 6. This month's edition looks at how automakers are adapting to a digitally dominated future and how they will make themselves key players in this new and competitive environment. A key partner in automakers’ transition into offering connected vehicles that will soon be able to drive themselves is Nvidia. The Silicon Valley-based chipmaker has introduced a supercomputer that utilizes so-called “deep learning” to enable self-driving capabilities. We interviewed Nvidia Director of Automotive Danny Shapiro to learn more. Smart’s refreshed and expanded model range has given the Daimler subsidiary a big boost. We asked Smart CEO Annette Winkler whether the next logical step for the brand was to add a crossover. You might be surprised by her answer. Jaguar is entering a new era with the introduction of its first crossover, the F-Pace. Sales boss Andy Goss explains why he thinks the F-Pace will become Jaguar’s best-seller of all time. Ford of Europe’s 6.3 percent operating margin in the first quarter and its $434 million pre-tax profit were big news, especially since the automaker lost $42 million during the same period last year. Europe CEO Jim Farley breaks down the keys to Ford of Europe’s Q1 success. Mercedes-Benz wants to become the leading choice among premium car brands for women by 2020. Daimler CEO Dieter Zetsche shares his reason for setting this target. Subcompact demand in Europe is set to peak this year before competition from small SUVs and crossovers starts to diminish demand in the region’s largest and most competitive segment. We examine the segment’s future. We look at the changes that Volkswagen has made to its new Tiguan to make it an even tougher competitor in Europe’s compact SUV segment, where it ranks second behind the Nissan Qashqai. Car hacking is a hot topic, but BMW’s vice president for new technologies and innovation, Christoph Grote, explained why the problem is not as much of a challenge to automakers as many people assume. German supplier Schaeffler is counting on electrification to boost the appeal of manual transmissions. We look at the steps Schaeffler is taking to make the gearbox more fuel efficient without a big increase in the cost. Also, don’t miss the profiles of our 2016 Rising Stars, who are the young and talented executives with the capability to reach the highest levels of the industry. From automakers to suppliers, manufacturing to design, engineering to information technology to purchasing, each Rising Star has spearheaded change and made progress up the career ladder. Click here to learn more.